Japanese have a specific knife which is the best Japanese kitchen knife for each specific task in preparing traditional Japanese food. Most Japanese knives are only single beveled which means they are sharpened on one side only. Over the years the Japanese have started to incorporate more Western Knife shapes into their knives. Most Japanese knives are made by hand using the finest quality steel using superior craftsmanship, therefore Japanese knives will almost always outperform any other Western knife. 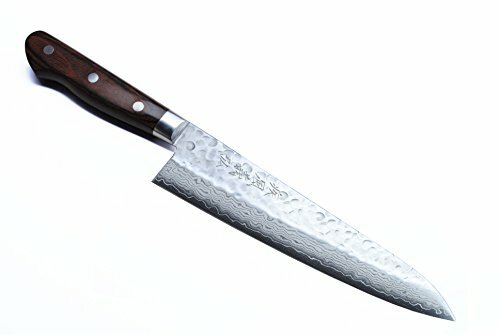 What is the Difference between a Japanese Knife for the Kitchen and Western Kitchen Knives? 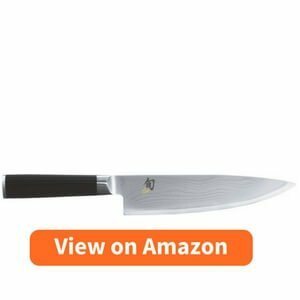 Why a Japanese Brand Kitchen Knife? This knife will cut neatly and with superior precision through fruit, vegetables, meat and almost any other food type. Are you looking for a premium and professional knife? The Shun Premier will be a gorgeous addition to exemplary results. For a smaller budget and something less fancy, the Yoshihiro Gyuto will give you exceptional performance for a lower price. The name Santoku means “three virtues” in Japanese. The Silverpoint Santoku excels in three functions, slicing, dicing and mincing, making this knife an absolute must for every kitchen. The hardness range of a Japanese knife is much higher than that of Western knives with higher quality steel used which ensures the blade lasts longer and stays sharper. In knifemaking, most German steels used are the same but for Japanese Knives for the Kitchen, a variety of steels and alloys are used depending on the purpose of the knife. 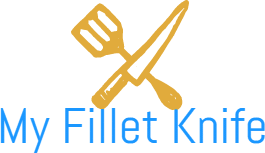 What makes them one of the top kitchen knives is also the fact that they have a finer angle at the cutting edge because of the harder steel meaning that the knife will be much sharper. Japanese knives are much more lightweight with a thinner blade than most robust and heavy German knives, therefore, should not be used for heavy-duty cutting. Japanese knives feature finer characteristics and subtle variations in order to cut food more cleanly and precisely. The best kitchen knife you will find in the world is a Japanese kitchen knife by far. The Japanese are known for their delicate and exquisitely prepared artistic dishes such as the finely cut and sliced sushi, therefore their utensils will be perfect for the high skilled performance that the Japanese require. A Japanese kitchen knife has finer detail and is more lightweight with a thinner and harder blade than most Western knives. Another indicator of how well a knife will perform is how thick or thin the knife is on its edge. A knife that is thick behind the edge has a greater tendency to break with heavy use than a knife that is thin behind the sharp edge, where a thick edged knife can also be difficult to perform simple tasks with. A Gyuto which is basically the Japanese version of a Chef’s knife is normally asymmetric. A knife is ground in such a manner to aid in food release where the right blade will usually be convexed and the left flatter.If a knife is not labeled for the use of a left handed person keep in mind that its design is then usually meant for right-handed use. The most common steels are Carbon Steel which retains their edge better but has a tendency to rust, Stainless steel which can survive being wet and dirty for longer, and Powdered Steel which is harder and less brittle. Keep in mind that the harder the high carbon steel the more likely the blade is to chip. A Western-style handle will be more balanced and heavier in weight, whereas a Japanese handle is made from lightweight finely detailed wood. Japanese handles are easier to replace and they can accommodate a thinner blade. Therefore depending on the weight and shape of the Knife you are looking for you can choose a knife with a Japanese style or Western style handle. Japanese Kitchen knives are mostly intended for light duty work and for preparing a fine and intricate cuisine. You will have less strain on your hands and muscles. Less tension and hand fatigue. A great choice for beginners because it is so comfortable and easy to use. The blade on a Japanese Knife is much harder and keeps its edge for longer. Because of the thinner and sharper blade, you can perform finer cuts and slices with ease. The Japanese always strive to better their performance, therefore you can look forward to newer and better models of knives from them. The Japanese use the finest materials to manufacture their knives. Japanese Kitchen knives are made using the finest methods and craftsmanship that has been improved on for many years. A gorgeous knife with a hard blade and finely decorated Birchwood handle for superior quality and performance. The Cryodur Steel blade is extremely hard, razor sharp and durable. The blade is hardened in a vacuum furnace for the top of the notch quality. The Birchwood handle is lightweight and decorated with a Damascus flower pattern for a stunning appearance and comfortable handling. The corrosion resistance is much greater because of the cryogenic treatment that the blade undergoes. The knife comes sharp out of the box and ready to be used. Small flaws were noticed in the Birchwood handle. Does not come with a cover. A versatile 8 Inch Chef’s knife that is perfect for slicing, chopping, dicing and cutting almost anything. The Shun Classic is truly one of the best knife that you will find. Manufactured from VG-10 stainless steel clad with 32 layers of hardened carbon stainless steel for the finest quality and long-lasting durability. The surface is patterned and layered with the look of Damascus steel. The added rust resistance is a great advantage. The handle is made from black, laminated Pakkawood in a D-shape for maximum comfort and elegance. 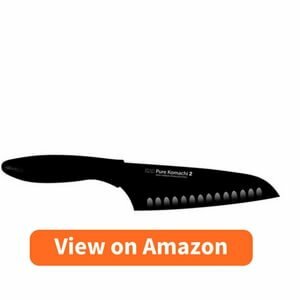 This professional chef knife is dishwasher safe and comes with a limited lifetime warranty. Said to chip and lost its edge after some time with heavy duty use. 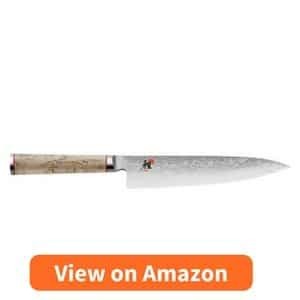 The Yoshihiro VG 10 is a Japanese Chef’s knife that is known as one of the most essential and versatile knives to have as it can be used to chop, slice and dice vegetables, fruit, and meat, as well as to carve roasts and poultry. A 3 layered construction with VG-10 Japanese steel for sharpness, edge retention, and durability. Very easy to sharpen and does not dull quickly. The 16 layer hammered outer steel eliminates friction and prevents food from sticking to the blade. The Mahogany wood handle is of premium quality with a full tang and comfortable to use. Comes ready to use out of the box and is handcrafted in Japan. The Bolster is not fully integrated with the blade in some models. An affordable and elegant, lightweight Santoku knife that will retain its blade and has a comfortable ergonomic grip. This is an inexpensive, slick looking, light-weight, santoku knife. I treat this knife like a chef’s knife, basically using it for all things meat, vegetables, fruit, prep, sushi, etc. It is very sharp and has retained its blade nicely for the six months I’ve had it. I hand wash it as I believe you should always hand wash your knives. The grip is comfortable and the knife is ergonomic. Can be used as a chef knife for more functions. The hollow ground edge reduces friction. Food safe and FDA approved. The ergonomic handle ensures a more secure grip that will not slip. A blade sheath is included for safe storage. Very lightweight so not for tough cuts. 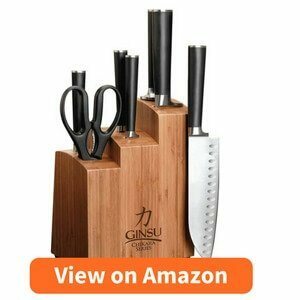 An eight-piece stainless steel Japanese Knife set from Ginsu. All you will need in the kitchen to create a professional and delicately decorated meal. Versatile and specialized set of all requirements. Comes in a nifty wooden holder that stands on your kitchen counter. Rounded Japanese style handles from heat and water resistant resin. The rust-resistant blades will hold their edge for very long. Included is a lifetime limited warranty. The edge on some of the knives does not last as long as promised. 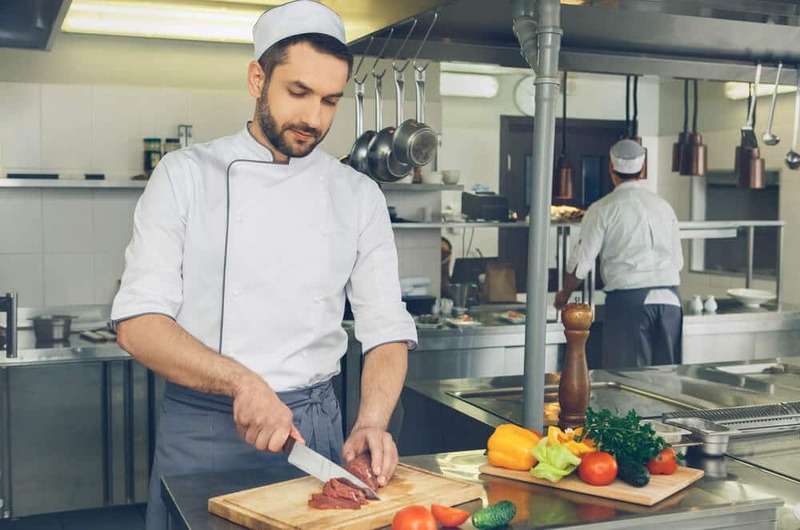 Japanese kitchen knives are by far your best choice when it comes to serving finer and more professional cuisine, although I would not recommend most Japanese kitchen knives for heavy duty cutting and carving because of their harder and thinner blades. 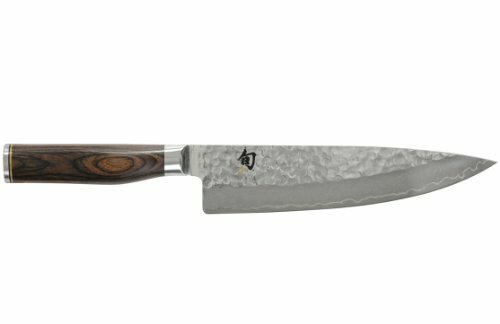 The Yoshihiro VG10 16 Layers Hammered Damascus Gyuto Japanese Chef’s Knife 8.25is a proper all-purpose chef’s knife and most certainly one of our favorites because it can be used for finely detailed slicing and dice as well as heavy during cutting and carving knife. 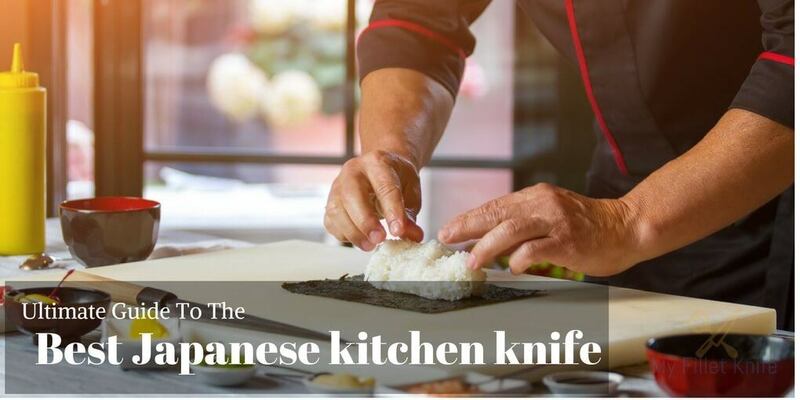 For finer and more delicate and precise slicing and cutting the Kershaw Pure Komachi 2 Santoku knife is lightweight and has a non-stick blade making it especially desirable for preparing dishes such as sushi. 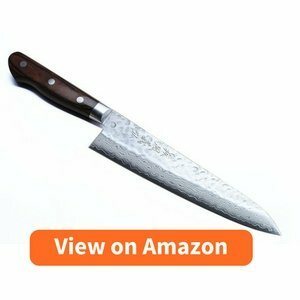 All these listed knives are of the finest quality and rated as the best models and brands in the Best Japanese Kitchen knives, just keep in consideration to choose a knife for the specific purpose that it is to be used for.